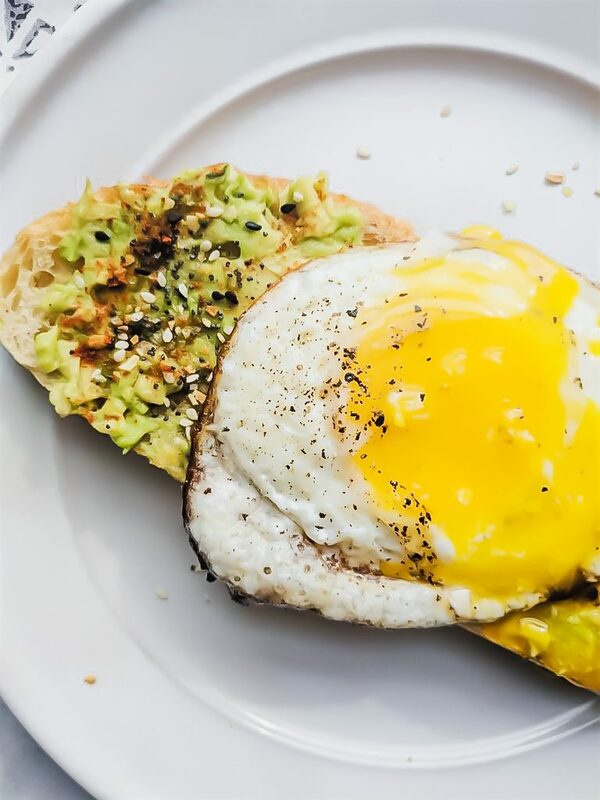 Toasted sourdough bread topped with mashed avocado, the best everything bagel seasoning with an easy fried egg! 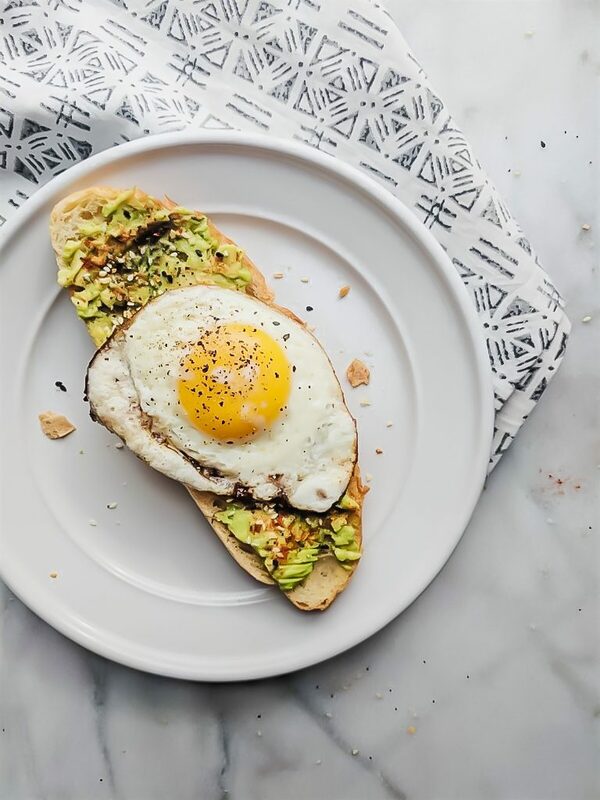 This Everything but the Bagel Avocado Toast will become your go-to breakfast! 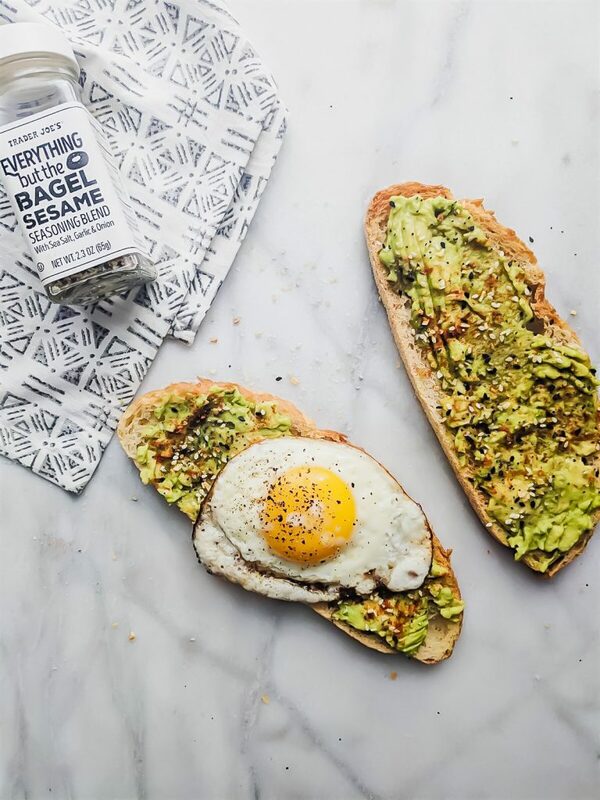 A few months ago, the world went crazy for a new spice at Trader Joe’s known as the Everything Bagel seasoning. Basically, it has salt, onion flakes, garlic and sesame seeds. Everything you love about that classic bagel….minus the carbs. BUT today. I added back in the carbs. With the love of every millennial’s life. Avocado toast (!!!!) Oh, and I also added on a crispy fried egg because #whynot. It’s so weird how your taste buds change as you get older. For instance, I used to HATE onions. Like, loathe entirely! Now, I eat them every single day. Similarly, I used to hate avocados. Which was fine with me at the time because they were/still are expensive. I even used to tell the waiter at my fave Mexican restaurant that I didn’t want guacamole that came with the dish I ordered. RIP TO ALL OF THE GUACAMOLE I COULD’VE CONSUMED. Now, fortunately/unfortunately for my wallet – I love avocados! They’re full of healthy fats, protein and bonus points – they’re delicious! My fave way to eat it is mashing it up into guacamole, adding lime, salt, cilantro and dipping about 36.5 tortilla chips in it while I’m watching TV. BUUUUUUT, this is my all time favorite breakfast meal. It’s a crunchy delightful piece of toast, smothered in mashed avocado, topped with that wonderful everything bagel seasoning AND cayenne pepper. 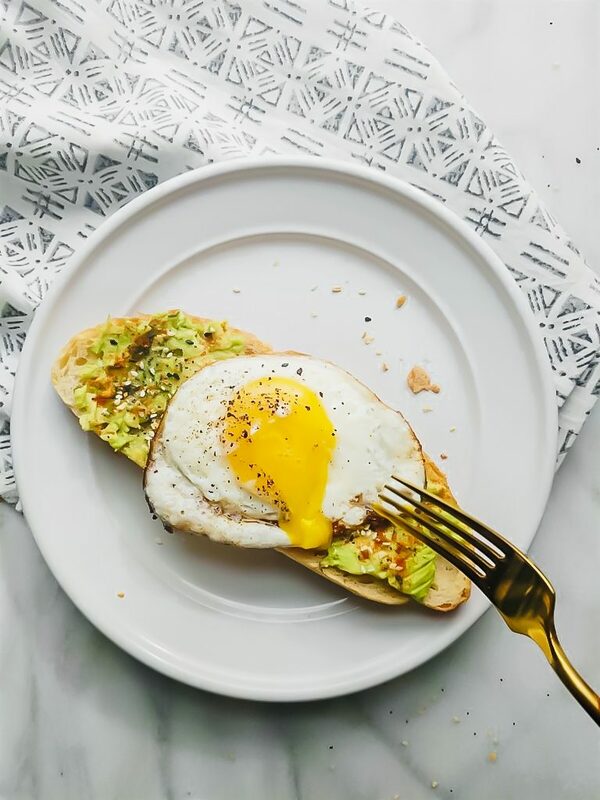 And if you’re feeling those extra protein vibes, a crispy runny yolk egg will bring this toast A LEVEL UP. It’s an extremely easy, flavorful and FAST breakfast. Can we just discuss for a second the fact that avocados are ripe for about .25 seconds and then BAM. They’re done-zo. Hard as a rock for the first 3 days you have it and then while you’re turning your back, they’re bad. You seriously gotta keep an eye on those babies. A few quick side notes before I give you the recipe: I always mash my avocado in a bowl before I put it on my toast. Some people like chunks of avocado or even the fancy avo roses! Feel free to do what you’d like in this recipe – it’s very customizable. Same with the egg. I fried mine aka I cracked it in a pan with butter, and let it cook until the egg whites were completely cooked through. This makes for that super runny yolk that I live for. However, I have also had this with scrambled eggs and it’s just as good! Feel free to fry the egg, poach it, scramble it, sunny-side-up it, whatever works for you! Lastly, the everything bagel seasoning is VERY strong. I’d say I used about 1/2 a tsp on my toast. It’s very flavorful so make sure and start light when you add it to your toast! 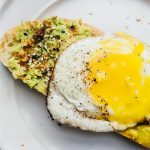 I recommend eating this right when you make it – the egg is going to be the hottest, so is the crunchiness of the toast. Pair it with a cup of coffee and you’re all set. Enjoy! Place your bread in your toaster. Meanwhile, open up the avocado, take the pit out and mash it in a bowl. Use a dash or oil or butter and coat a pan. Place it on medium heat and crack and egg in it. Add salt and pepper to taste. Let it cook for 3-4 minutes or until the whites have cooked through. Once your toast is done, spread your avocado on it. Add the everything bagel seasoning (add as much or as little as you want - just remember, it's powerful! ), a dash of cayenne pepper and the egg on top! OK…so I want to make this in the morning and I don’t have that seasoning…what’s in it?!? Can I replicate it in a pinch??? It looks AMAZING!! I LOVE avocado…I eat them nearly every day!…and when they all ripen at once, I freeze them for smoothies! Yum – you’ve made me want to eat this for lunch as I have some avocados that will be gone in 2.5 seconds too! I love your pictures Haylie – found you here from FBP. Do you shoot with a really nice camera? I am getting ready to launch my blog and your post on the “not blogging full time” really resonated with me so I hopped over here and really like your layout, etc. I am starting out w/my phone so we’ll see. Hope to connect on FBP!